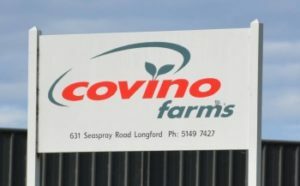 Covino Farms is owned and operated by the Covino family consisting of brothers Steven and Peter and our parents Ugo and Maria. We have lived in the Longford area since 1993, about two hours east of Melbourne in Gippsland. We live and work in the local community. Our Longford farm comprises 3,500 acres where we grow mainly lettuce, salad mixes and carrots, but also other fresh vegetables which we supply to the eastern states in Australia.